Discussion in 'Fixed Blades' started by dancom, Sep 13, 2018. I am getting close to finishing an order. Seems like it took all summer. Looks like a fun summer to me. Nicely done as usual Dan. Wow. Dan nice work some real fancy work into them. That should make some people happy. That's awesome. This will only help spread the word even more. You have a thriving customer base Dan. Good on you! That's a whole bunch of nice knives there. Well done. Looks like some pretty nice handle wood you have there! Thanks man. 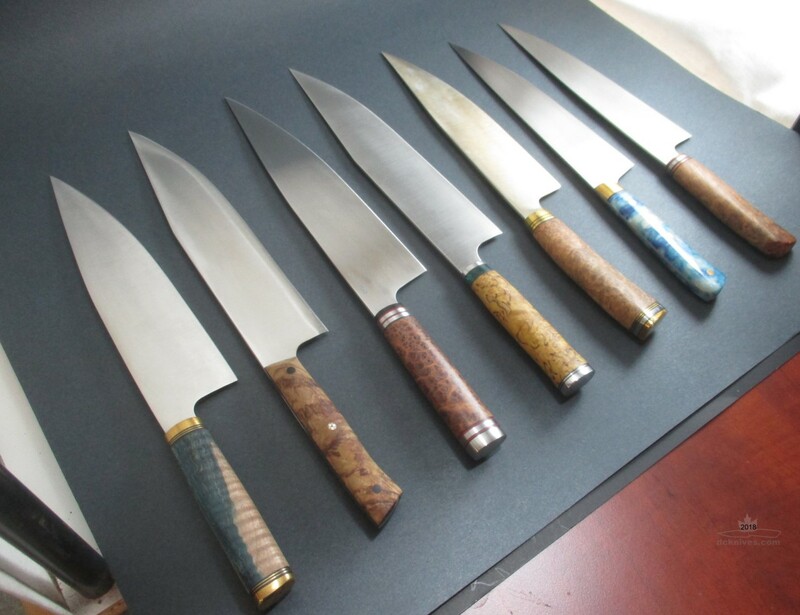 I used only stabilized wood or synthetic materials for kitchen knives. The wood is mainly from Don Stevenson in B.C. He's operating at http://www.woodstabilizer.com. Other wood from eBay Stabwood Lab and the Acrylester I get from Wood-Acrylic Supply also on eBay.